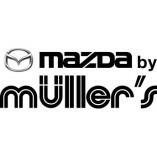 Mazda by Müller’s Saarlouis offers professional service. Mazda by Müller’s Saarlouis is flexible with regards to potential changes. Mazda by Müller’s Saarlouis ... provides services above and beyond what is expected. Die Annahme , Reparatur und Abholung liefen alles reibungslos und sehr schnell.